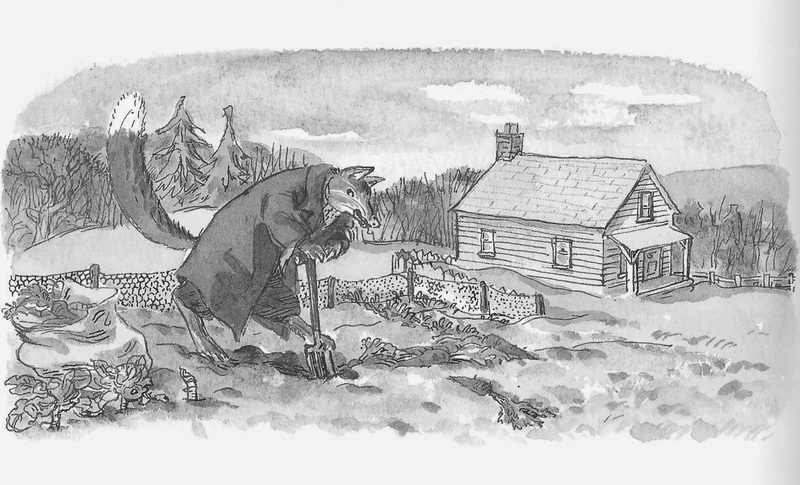 One winter morning, Brer Fox stole into Brer Rabbit’s garden and dug up a big sackful of his best carrots. Brer Rabbit didn’t see him as he was visiting his friend Brer Bear at the time. When he got home he was mighty angry to see his empty carrot-patch. He went along, lippity lip, clippity clip, and his little nose wrinkled at the fragrant smell of soup coming from Brer Fox’s house. At this, Brer Rabbit kicked the door, blim blam! He hammered on the door, bangety bang! It wasn’t any use. My, he was in a rage as he turned away. Kind friend Brer Rabbit indeed! He stomped off, muttering furiously. But soon he grew thoughtful, then he gave a hop or two followed by a little dance. By the time he reached home he was in a mighty good temper. Brer Rabbit had a plan all worked out. He’d get his carrots back and annoy Brer Fox into the bargain! On Christmas Eve, Brer Rabbit heaved a sack of stones on his shoulder and climbed up onto Brer Fox’s roof. He clattered round the chimney making plenty of noise. “That’s easy,” Brer Fox cried, “here I come,” and he disappeared up the chimney. Like lightning, Brer Rabbit was off that roof and in through the open doorway. There were his carrots in a sack, and on the table was a fine cooked goose and a huge Christmas pudding. He grabbed them both, stuffed them into the sack and ran. Chickle, chuckle, how he did run. That old Brer Fox struggled up the chimney, higher and higher. He couldn’t see any string but he felt it hanging down so he gave a big tug.The sack opened and out tumbled all the stones, clatter bang, bim bam, right on Brer Fox’s head. My, my, he certainly went down that chimney quickly. Poor Brer Fox! He’d lost his Christmas dinner and the carrots, and now he had a sore head.